The Internet has provided information from all types of sources to satisfy the needs of almost every type of interest. Some of us might dismiss most of it as useless and time-wasting. On the other hand, we find it helpful in many ways. A person with a basic education can become informed in many areas through the use of the Internet. The problem is that most have no guidance when it comes to vetting the material that is online. In college, through lectures, text books, and selected readings the student become familiar with reliable tools and learns how to avoid the unreliable ones. Recently I have been looking at some materials that can be extremely helpful to those who wish to come to a better understanding of the Bible through an understanding of the Land of the Bible. At our Biblical Studies Info Page (under Scholarly, then Blogs) we keep links to some very helpful blogs. We have a few great links on this page also. Today I wish to share a few links that should be helpful. The Lanier Theological Library in Houston presents several top-notch lecturers each year, and the videos remain online for those not able to attend. The lecture I wish to point you to today is Dr John Monson – Physical Theology: The Bible in its Land, Time and Culture. Monson lived in Israel as a child and learned the importance of the land in understanding the Biblical text. Plan to spend a few hours in listening, pausing to take notes, or to listen again to one of his points. I had the pleasure of hearing this lecture a few years ago at a professional meeting. Monson current teaches at Trinity International University. Now, here is a brief view. David Pettegrew, at Corinthian Matters, calls attention to Ancient Corinth via Drone. Those who have visited Corinth will find this video extremely interesting. It also includes some identifying captions. I was getting ready to post this blog and noticed that Charles Savelle (Bible X) was posting some pictures on FB of his current trip in Greece. He has granted permission for me to share this beautiful photo of the Bema in the Agora at Corinth, with the Acrocorinth in the background. This is where the Apostle Paul stood before Gallio (Acts 18). If you do not frequent Bible X, do so now. Lot’s of helpful information, especially for students, teachers, and ministers. 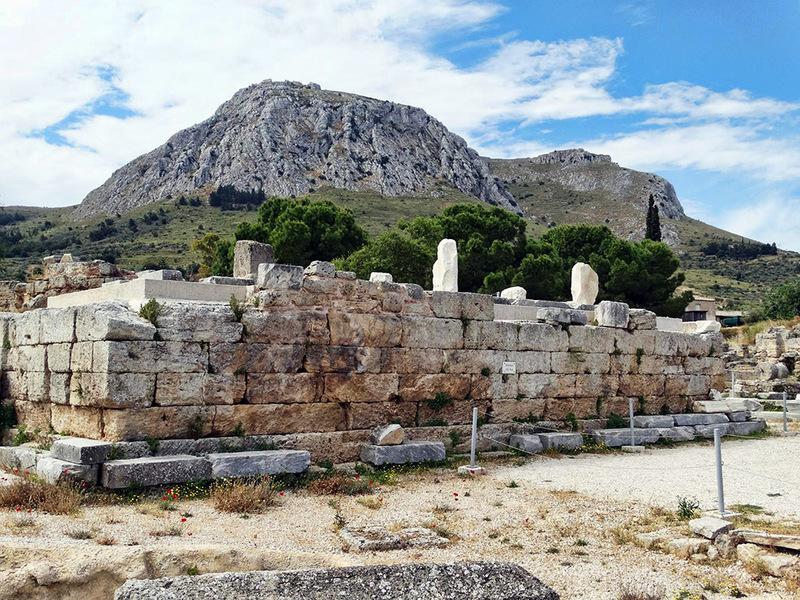 The Bema (judgment seat) in the Corinth agora, with the Acrocorinth in the distance. Photo by Charles Savelle. Bill Schlegel, author of Satellite Bible Atlas (available here), has been making short drone videos of various portions of Israel to be used with his atlas. So far he has posted 13 videos on YouTube here. Bill is Associate Professor of Bible at The Master’s College, Israel Bible Extension (IBEX) and he uses some of his students to add explanatory notes to the videos. When you purchase the Satellite Bible Atlas you receive access to all of the maps in .jpg format, and 70 photos made from the drone. These include several places rarely included in photo collections. This atlas can be very helpful for anyone visiting Israel, or studying the Bible at home. This entry was posted in Archaeology, Bible Lands, Bible Places, Bible Study, Book Review, Israel, New Testament, Old Testament, Photography, Travel. Bookmark the permalink. Thank you so much for your hard work for the Lord. I look forward to viewing these sites while seeking employment. I am very glad you share freely the knowledge and resources you have acquired over the years. And I thank God every day for all who have dedicated their lives to the study and proclamation of God’s word. May you receive double honor for your efforts, and may many come to know the truth and be obedient because of your diligence.